Fraud examiners might not always think of themselves as journalists, but there might be more overlap than you think. Both professions conduct interviews, they investigate documents, they write up their findings and, if they’re lucky, they can find unexpected breaks in cases or stories thanks to whistleblowers or unexpected sources. In her remarks to attendees at the 2018 ACFE Fraud Conference Asia-Pacific, veteran reporter Kate McClymont stressed the importance of those that come forward to blow the whistle. 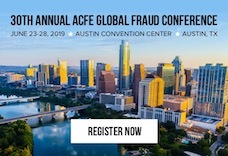 After receiving the ACFE’s Sentinel Award during Wednesday’s closing general session of the 29th Annual ACFE Global Fraud Conference, Kathe Swanson said, “I have finally received my closure,” as supportive attendees gave her a standing ovation. Bastian Obermayer’s life changed a few years ago when he received more than 11 million documents from an anonymous source. The collection of documents would later be known as The Panama Papers. Obermayer, deputy head of the investigative unit of the Munich-based Süddeutsche Zeitung, took attendees at the 2018 ACFE Fraud Conference Europe through the story of how more than 200 investigative journalists in 70 countries helped wade through the 2.6 TB of data he was given. In his address to the hundreds of fraud fighters in attendance, Obermayer stressed not only how large the undertaking was, but how important it was for the journalists to work together. If you have a fraud hotline at your organization, who is your targeted user? A low-level employee who notices something wrong happening above them? A manager who reads emails about plans of possible collusion? An executive who oversees the bidding process? The answer is everyone, according to Waheed Alkahtani, CFE, CEPP-1, Sr. Auditor at Saudi Aramco.